Paramaribo, Suriname - Many of the young volunteers who have taken part in a Religious Youth Service (RYS) project have gained a unique experience in cross-cultural cooperation and that has provided for some a strong confidence and spirit enabling them to continue to promote friendship, cooperation, and interreligious understanding. RYS alumni have been active givers in all parts of the world, and they have expanded the circle of positive influence that is part of our lasting legacy. In recent years, Suriname has opened its heart to welcome teams of RYS volunteers, and their presence has made an impact in a variety of communities. The hard work of the RYS members has provided stimulation toward developing the spirit of volunteerism within the country. 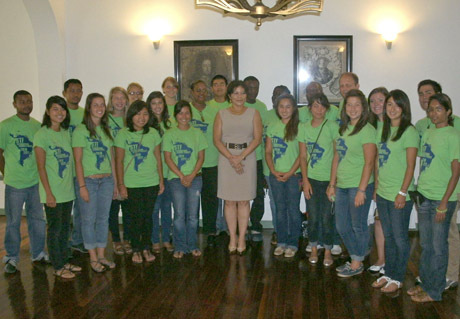 At a May 19 meeting with Suriname’s First Lady Ingrid Bouterse-Waldring and RYS alumna and members of the "Generation Peace" team from the US, Georgia Pearson reported on the work of RYS in Suriname and explained that the "Generation Peace" team was offering three weeks of service in the nation. On hearing the report, Madame First Lady asked those Suriname youth present to build on the spirit of volunteerism embodied by RYS and the "Generation Peace" team and to initiate a national volunteer organization. "Our nation needs to develop the spirit of volunteerism like what we have experienced through the work of these young adults," she said. RYS volunteers and RYS alumni are active around the world and the spirit that has inspired them is continually finding new expression. The First Lady of Suriname is one of many leaders around the world who have recognized this spirit of service, and she will work hard to see that it becomes part of her nation’s culture.